I just wanted a Blog so here you go!! Where Does “My Inspiration” Come From? Sometimes I wonder where do I get the ideas to make the jewelry that I make. I know sometimes I would see something that I like and I make it, however most of the time it does not look exactly like the piece I was inspired from. I sometimes wonder if I have an ancestor that whispers in my ear some of the creations I come up with. Sometimes I would make something and then later on down the line see something similar to my piece and I say to myself, I hope I didn’t copy them. Sometimes I am inspired by other people’s design, but as I said earlier it when I do make it, never looks like the piece that I was inspired by. And when I do copy am inspired by people’s design I wonder do they mind, should I tell them or pay them some type of inspiration fee, I don’t know. I know that I saw someone make the same exact piece as I did once and I wasn’t mad at all. I was glad to be an inspiration, it makes made happy. But getting back to the spiritual aspect of my jewelry making. Whenever I create, I usually need a clean space(even though it may be messy by the time I’m through), nice music and burning incense is a must. If I don’t have these three elements, my creative process will be stagnant. Not to say I can’t create without these elements, but having these elements are ideal for my work environment. 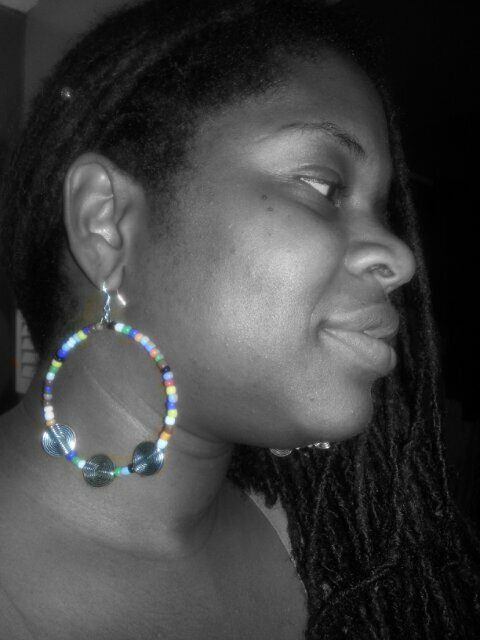 Where in the H-E double hockey sticks did I come up with these funky pair of earrings. 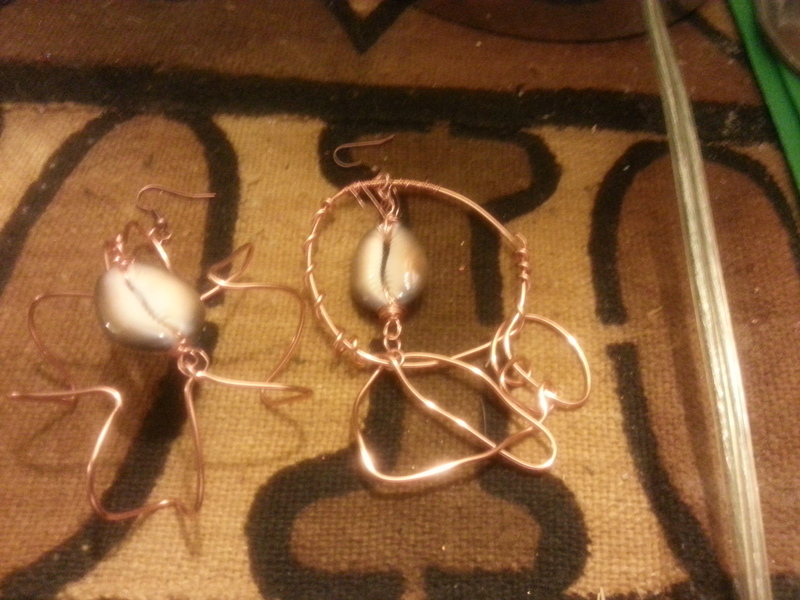 The thing about these is that I was just playing around with shaping wire and came up with these. 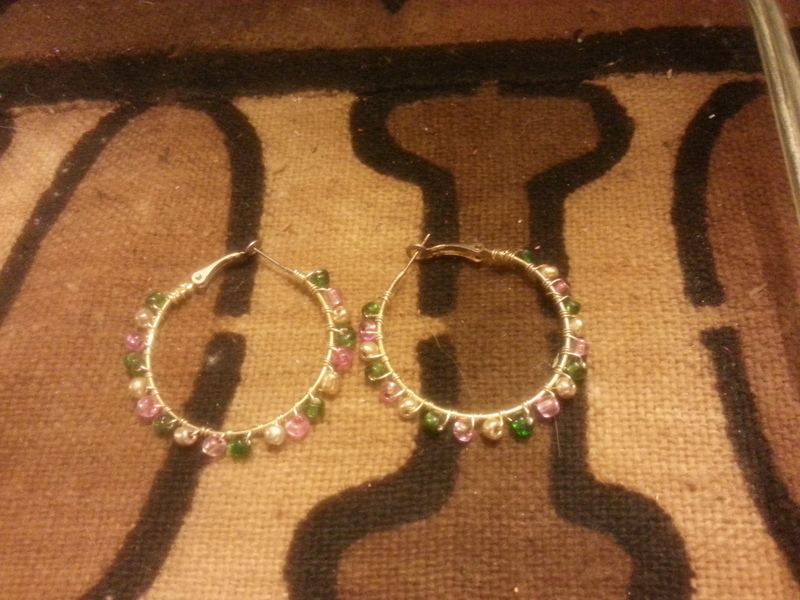 I don’t know if I’m going to keep them a pair or make other funky earrings to match. I really love these, but I do plan on selling them. I do make stuff for myself, but if the spirit doesn’t tell me to keep them, I sell them. I’ve been on a double hoop making kick for a minute, but these just didn’t look right as a double hoop so I just made two separate earrings, which turned out pretty nice. Oh I used an app to isolate the colors to, I think that brings more drama to the picture. SN: one I hope to make enough money from my site that I can afford a photographer, cause taking all of my own pictures for my site is a beast, but I digress. I actually made these for my sister, I need to send these to her ASAP( her birthday was in December). But all in all I think I may have had an ancestor who was an artist and created things, because honestly most of the items I make the design just pops up in my head and I have to make it before my soul will rest. Do any of you artisans experience the same thing or something similar when you are in the creative process? Let me know with your comments. And always remember I love making custom orders. "I'm not a rapper, I'm a poet with a hip-hop style"